This is the second in a three part series that reviews audiovisual technologies that will save the most time and money for business communications and collaboration. If you would like to download the entire white paper with all three parts, please click the button below. Today’s workplace is more flexible than ever, with web-based videoconferencing and streaming options enabling efficient collaboration between local and remote team members. Busy travel schedules and expansion to new office locations are easily accommodated by web meeting tools that help make it feel like everyone is in the same room at the same time. Expansion and adoption of these new tools has been rapid, and many companies are finding it challenging to outfit offices with enough spaces to allow as many team members as possible to communicate in these new ways. Demand for high-tech rooms is up at a time when real estate is at a premium, which has caused the evolution of a new style of meeting space. New huddle rooms have joined the roster of available options for employees looking to gather quickly and share a screen and/or communicate via videoconferencing. Tending to be smaller in size, or simply cordoned off in disused sections of floor plans, huddle spaces reflect the efficiency of new meeting styles. They are typically outfitted simply, with a few chairs around a small table, a large flat- screen display, a video camera, and a microphone and speaker system for clear communication. Given the number of free or economically priced communications tools available online, it might be tempting to rely on laptop cameras or a basic web cam and screen setup to outfit a huddle room. Unfortunately, that leads to the wrong kind of huddle—one where multiple meeting participants are huddling around a tiny camera and default laptop microphone and speakers. Operating as the physical extension of business, web-based videoconferencing and huddle rooms are equally dependent on quality hardware solutions to optimize the benefits of these tools. Careful selection of the right cameras, audio equipment, and an easy-to-use control system will prevent distractions caused by bad video and audio quality, or confusion in meeting-room setup. A well-designed huddle room that includes technologies optimized for the space will help a company create the right impression both in the room and with clients and prospects. To ensure that huddle rooms enhance productivity and boost a company’s image, invest in purpose-built meeting room technologies. Even in a small space, a noticeable image difference is provided by a specialized HD camera with a lens built to capture every participant in the room. Similarly, a properly placed microphone system built to capture voices from around the room will reduce listener strain on the far end. In-room loudspeakers, too, will help to provide clear communication. Tie all of these technologies together with an audiovisual control system that realizes the easy and efficient instant-meeting setup. Integrated with office software solutions, a huddle room control setup incorporates calendar details to reduce room reservation confusion. The touch interface also provides quick access to video calls and collaboration tools for content sharing. Whether used for connecting remote coworkers or introducing a new client to a team, huddle rooms bring the best return on investment when image, voice, and control options are very clear. 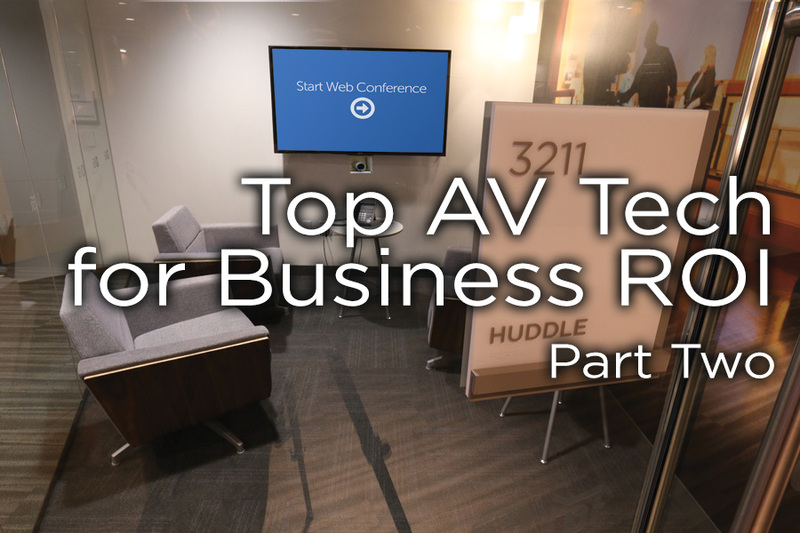 Whether a company is using a videoconferencing codec or web-based tools, a huddle room pays for itself with efficiency and productivity enhancement. With reputation-saving audiovisual hardware, ROI comes with the amount of time saved and tasks accomplished in a meeting uninterrupted by technology problems. 65% of videoconferencing is done with room systems according to a study by Wainhouse Research.